BROADVIEW HEIGHTS: Cutting Edge Stencils Give Away! Cutting Edge Stencils Give Away! Time for a give away from Cutting Edge Stencils! Oh how I have loved all of the projects made from Stencils! 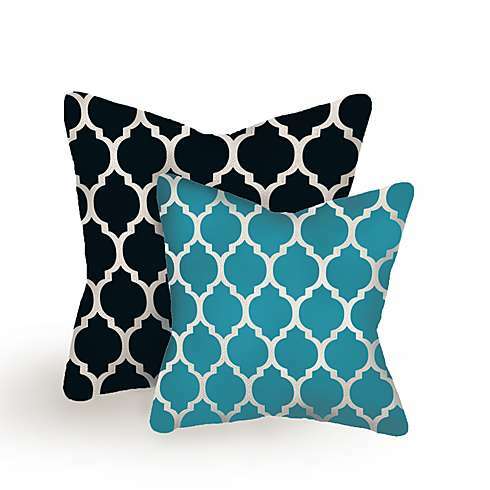 The curtains, the walls, the flooring and now with their craft stencils, the pillows! The possibilities are endless. Birch Trees on walls are all the rage now! Now is your opportunity to win a stencil of your choice (up to a $50 value) from Cutting Edge Stencils! And, shipping is free! You have three chances to win! The winner will be announced on Friday January 19th. You must leave a separate comment for each entry. If your email address isn't linked to your Google account, please leave your email address along with your comment so that I can contact you. Tough choice. I like the Anna Damask. I'm redoing the guest room and I would love to do a stencil wall in there. I'd do it behind the floating bookshelves I'm going to be putting in. Great giveaway. Love the Tree Peony. Have to get this one. I already follow you on GFC. I liked Them on FB. I liked the group on Facebook! I could desperately use the Aladdin or Casablanca! Would look great in my bedroom. i would love to win because i am coveting those birch trees for my hallway! The Damask is just so pretty and classic. That would probably be my favorite. can't decide between Connection, Paisley or Julia Allover! Ack! Ok - Paisley! Ohhh! I REALLY would love to win this giveaway! I have been looking for a stencil for the wall you see as soon as you enter my house, it goes into my kitchen. My first reaction would have been that the Casablanca Allover Stencil was IT. But after looking over the Cutting Edge website, Oasis could be it, Flora Damask, Anemone Strip, or WOW, a Paisley Allover Stencil...SWOON! I'm a follower! Great giveaway Mel! I'm a follower! Thank you for the great giveaway!!!! I like the zagora all over stencil the best (I like the fleur-de-lis one too) I want to stencil inside my closet. I am officially a follower! Love everything that you do! Houndstooth allover stencil is amazing!!! I would love to use it in my dining room on an accent wall. I am now a follower of cutting edge stencils!! Never one anything it would be amazing to win this! I follow you! Of course I do! I've been following CES on facebook for a while...love the inspiration pics they post from customers. So many great ideas. It's always so hard to pick a favourite, but I really love the LILY SCROLL ALLOVER STENCIL pattern...plus it looks fairly forgiving! I love the Paisley Allover Stencil & want to do my bedroom ceiling with it. I already follow Cutting Edge Stencils on Facebook. I like the Rabat All over stencil, and the Rabat craft stencil. I follow through google friend! I like them on faceboook! I love the casablanca stencil allover. I would use it in the ensuite bathroom. I love the wispy leaves and would use it as the feature in my master bedroom of the house we are renovating for our up coming retirement. I would also like to try stenciling some fabric to use in that room also. submitting this entry for Denise D who is a follower and having difficulty leaving a message here. submitting another entry for Denise D.
I liked Cutting Edge Stencils on Facebook! I'm a follower. I tried your link to the Cutting Edge Facebook page but it didn't work. I will try to get there some other way. Mel, I'm dying to try the Casablanca stencil in my bedroom! I followed you via GFC but the cutting edge fb page link didn't work. I really love the Aspen stencil. I'm in the process of decorating my office and am putting up bead-board and want to use this aspen stencil for the top part of the wall. Thanks for offering such a great give-away. Very generous of you!! Hard to pick just 1 but i love the DAHLIA GRANDE FLOWER STENCIL and would use it in my bedroom. I liked cutting edge on fb! I love the corner rosette window stencil. I have been to everyone of those French towns and to Notre Dame. They are beautiful. Hmmm... Its a toss up between the Trellis All over Stencil and the Negoya all over stencil. The usage of it is not a toss up however. I'd definitely use the stencil in our master bedroom. Its a converted attic in an old Victorian so the ceilings are high and there are random nooks all over the room. I have three that have windows but I have no clue what to do with them. A stencil would be a huge start to adding interest in the largest nook right beside out bed. If there was any monies left over I'd probably add in one of the craft stencils (Turkish tulip and/or the dandelion stencils) for making over an old dresser in my guest room. I'm a follower of your blog through google! I'm also a friend of cutting edge stencils on facebook! Love your blog and have been a member for some time. "Like" Cutting Edge on Facebook and hoping my name will be picked for the giveaway. I am struggling with a tabletop and the Casablanca stencil would be perfect.